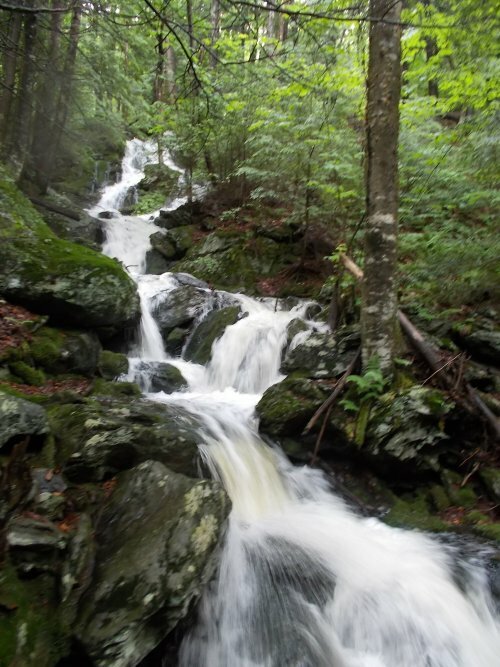 Another Long Walk: Day 106: Water, water, everywhere! June 21: It rained all night and continued heavily into the morning. 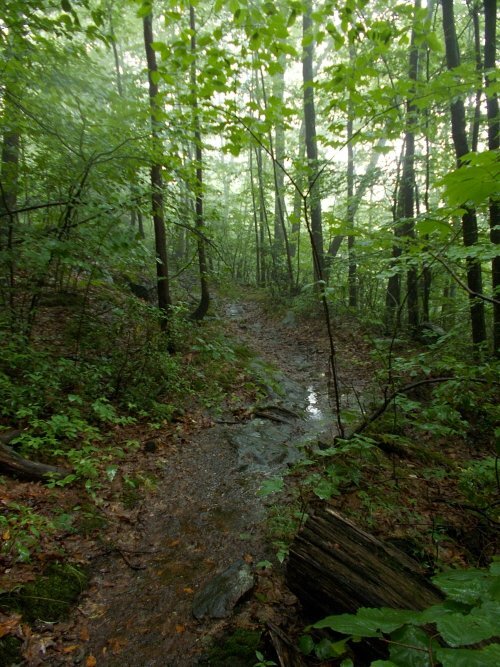 With little hope of the rain tapering off, I didn't linger under the dry confines of my tarp and hit the trail at 6:00. 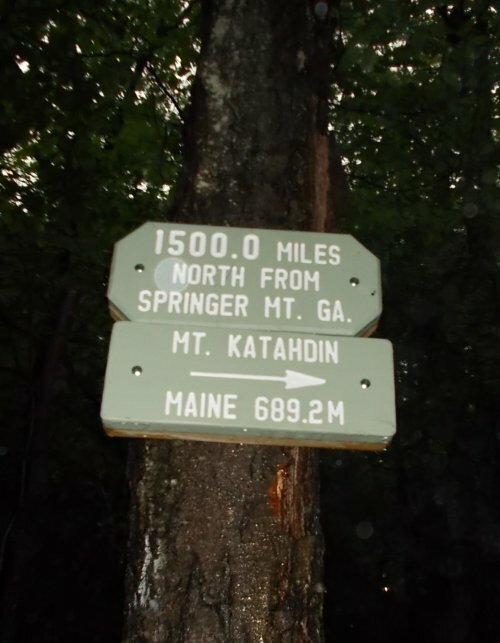 Early in the morning, I passed the 1,500-mile mark of the trail! Woo-who! I'd only walked a couple of miles when I felt the shoe on my foot suddenly loosen. The shoelace had broken. It had been fraying badly since New York which is why I picked up a spare pair of shoelaces left behind in a shelter, but I'd been too lazy to actually replace the laces on my shoe. Now, in the pouring rain, I still had no desire to replace the laces. Instead, I knotted the ends of the laces together. Not a shoelace knot that could easily be pulled open--there wasn't enough lace to do that--but an actual knot that I knew I'd have little hope of opening again later. It was a permanent knot! I figured I'd just cut them off at the end of the day and replace my laces that evening. 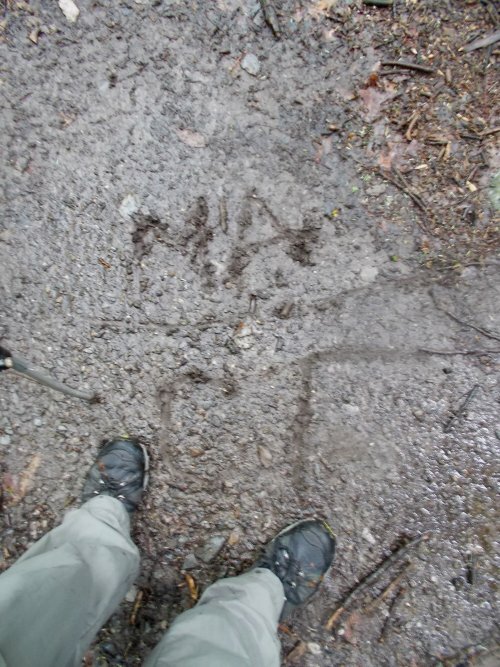 Four or five miles up the trail, I was able to get out of the rain in the Riga Shelter. There were a few hikers in the shelter who were lingering due to the rain, and Scibbles--who I'd met earlier--was camped in his hammock nearby. He must really hate sleeping in shelters if he preferred to use his hammock in the rain rather than sleep in the shelter! They also told me that the weather forecast they had seen suggested that the rain might stop by around 10:00 and it might even be sunny later in the afternoon. I could only pray that were true! I could have lingered to see what would happen, but I was already soaked to the bone and saw little advantage to waiting around. I continued hiking. I only made it 1.2 miles before I stopped again. Another shelter to get out of the rain! =) These shelters are unusually close to each other--it would have been helpful if one of them had been near where I camped for the night! Inside was an old man who told me that he was taking the day off because of the rain. He doesn't hike in rain. Ever. Which kind of irritates me. 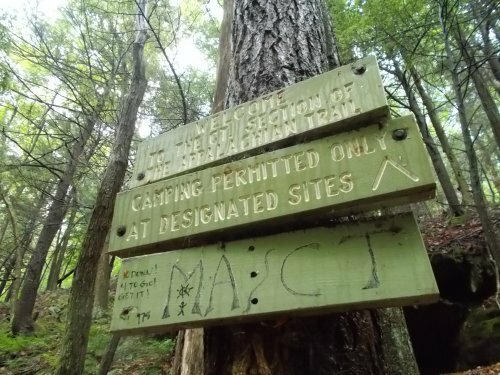 So he's guaranteed a spot in this shelter because he never got out, while any hikers that arrive late in the day after hiking through the miserable rain have to camp out in the rain? 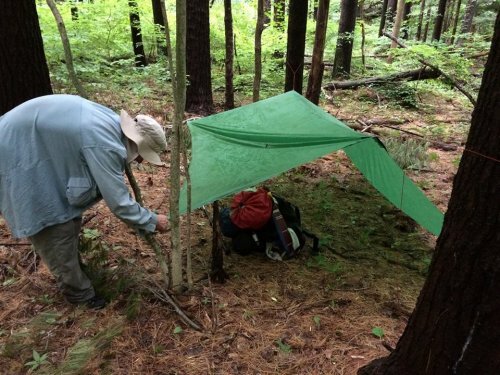 At least set up his tent and let someone else use the shelter, but he had no intention of doing that. And he was hiking southbound--the next shelter was a mere 1.2 miles away! At the very least he could make it that far! So in any case, he rubbed me the wrong way and I didn't much like him. At least I knew I wouldn't have to ever see him again! By the time I left this shelter, the rain had largely stopped. Tree snot continued to drop from the trees, but the heavy downpour had finally stopped much to my relief, but the damage had already been done. The trails were positively flooded! Creeks ran down the trail in torrents. 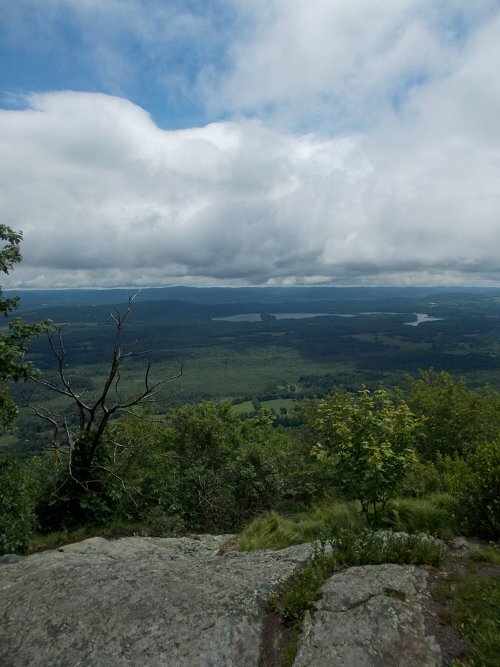 Another mile and a half later, I had reached the top of Bear Mountain, mistakenly known as the highest point in Connecticut by many. 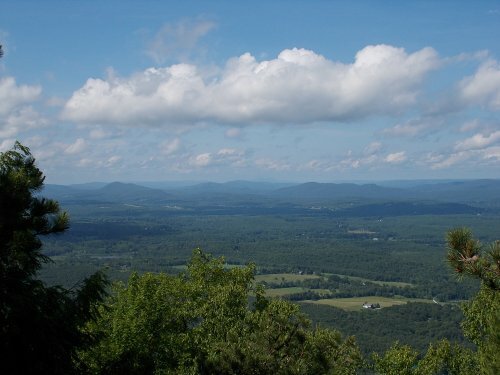 It's the highest summit in Connecticut, but there highest ground in Connecticut where one can stand is on the Massachusetts border on the south slope of Mount Frissell. 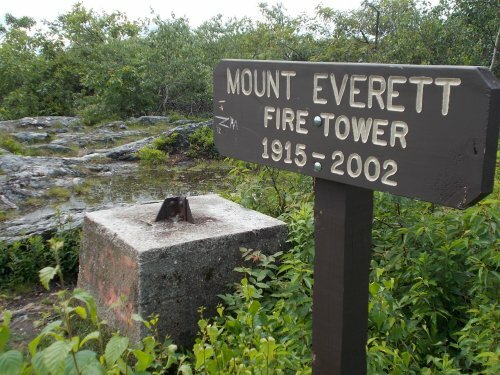 The summit of that mountain, however, is in Massachusetts and not Connecticut. So it's an awkward high point--on a slope partway up the mountain! And therefore Bear Mountain tends to get all of the glory. 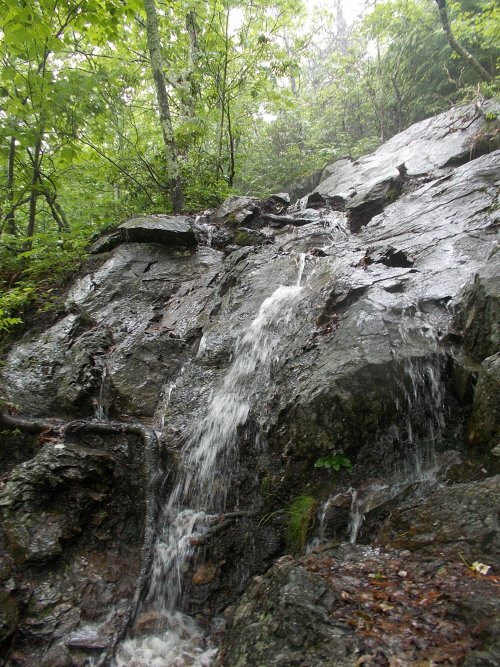 The trail down from Bear Mountain is treacherous: steep, rocky and wet. 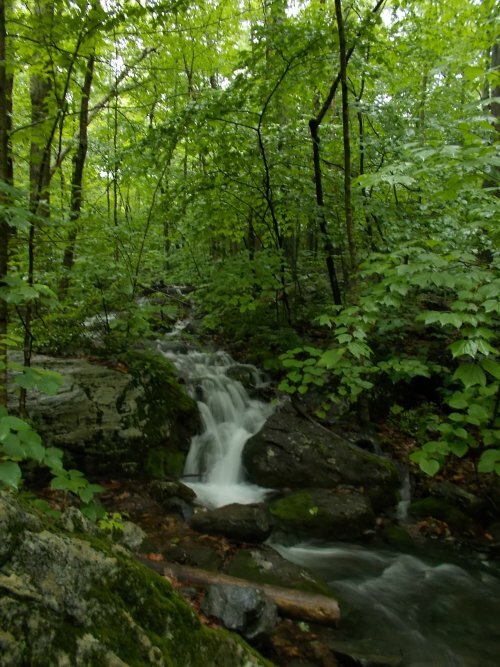 I remembered it being difficult from the first thru-hike and it was even more difficult this time around because of the recent rain causing a creek to run down the trail. The going was slow, but I took my time and made it down safely. I did pass a sign marking the border of Connecticut and Massachusetts--about half a mile beyond the actual border--next to Sages Ravine. A good size river was flowing and if you didn't know any better, you'd assume that the river was the border by the way the signs are placed. It's not, but the signs are very misleading! As for the river, it was flowing fast and high! I didn't remember having to ford this river during my 2003 thru-hike. 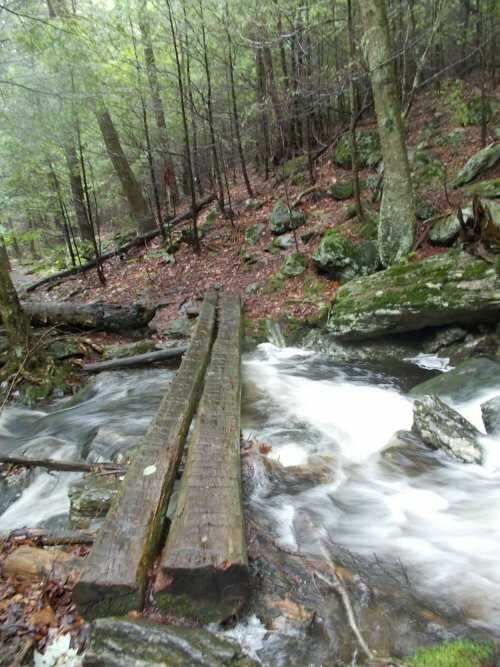 There was some sort of small bridge to get across, and if the water level was lower, I could probably walk over a series of logs that made a small dam. The water was much too high and fast for me to do that, though, so I pulled up my socks and just plowed through the water which was about knee-deep in most places. The trail headed back uphill, this time to Mount Everett which, if I remember correctly, is something like the 4th highest mountain Massachusetts. 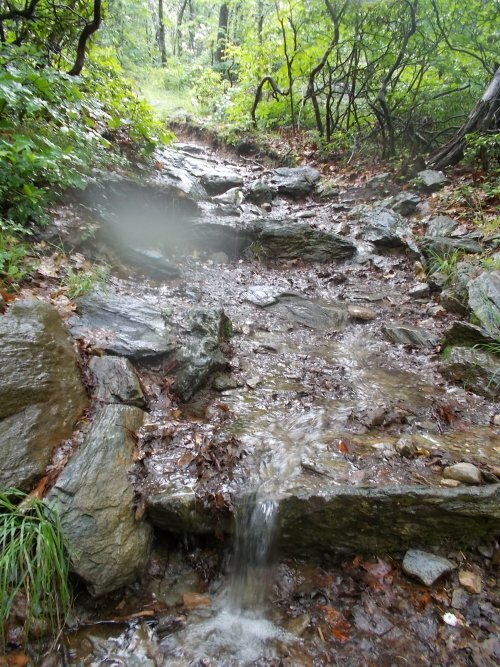 The trail was rough, and not the least because of all of the water running down it. Near the summit the clouds started to clear, though, and I could get some pretty nice views. Throughout the day the clouds continued to clear and the afternoon became quite nice! The rain from earlier would plague the trails all day, but at least the rain had stopped and temperatures warmed up again. I even thought about Hike Naked Day. It wasn't too late to participate for an hour or two! But at this point, it was so late in the day I was seeing a lot more people on the trail and didn't feel comfortable doing so. Nope, Hike Naked Day wouldn't be happening for me this year. Late in the day, I bumped into a couple of people I knew: Silent Doug and Clueless! Familiar faces! Familiar faces NOT from the Appalachian Trail! Okay, it wasn't entirely by accident. They knew I was on the trail and were traveling back from an event in Vermont. I had texted and called Clueless about my location earlier in the day and where I expected to be in the afternoon. I was running a bit later than I expected, but they intercepted me just before reaching MA 41 at a scenic overlook. They brought gifts of food and Coke and all sorts of good stuff. We walked back down to their car, and just as we arrived, it started to sprinkle again. ARGH! So the first thing I did was set up my tarp nearby. I had planned to walk further, but it was already late in the day and I had largely dried out (except for my feet) from the rain earlier, and I wanted to stay dry! So I called it quits next the dirt road and set up camp in the woods nearby. After my tarp was set up, we walked back to their car and chatted and ate the food they brought. Nothing came from the light sprinkle that scared me into setting up my tarp, but it was ready--just in case! The rain would pick up later in the evening. Eventually they headed off to go back home, and I headed back to my tarp--my home for the night. I was a little sad to see them go--I had really enjoyed their visit! 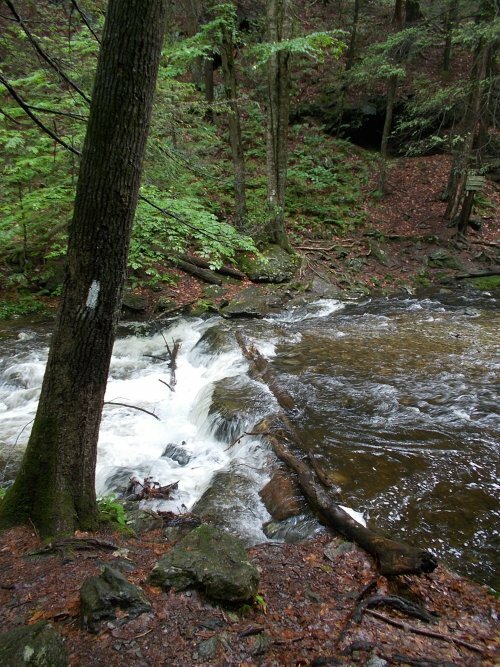 This is no creek--it's the trail! There were slugs everywhere! I cleared the ones I saw, then read my Kindle for an hour before looking around for more slugs and found a couple of more making the run up onto my gear. I flicked them off and started regular "perimeter checks" each hour until I went to sleep. Slugs don't move very fast so I figured I really only had to keep an eye on the perimeter of my groundsheet periodically rather than search all of my gear for them. Even after going to sleep, I'd do another perimeter check whenever I woke up during the night. In total, I lost count of the slugs after about 20 or so. The final count, if I had kept up with it, would probably have been over 30 slugs. 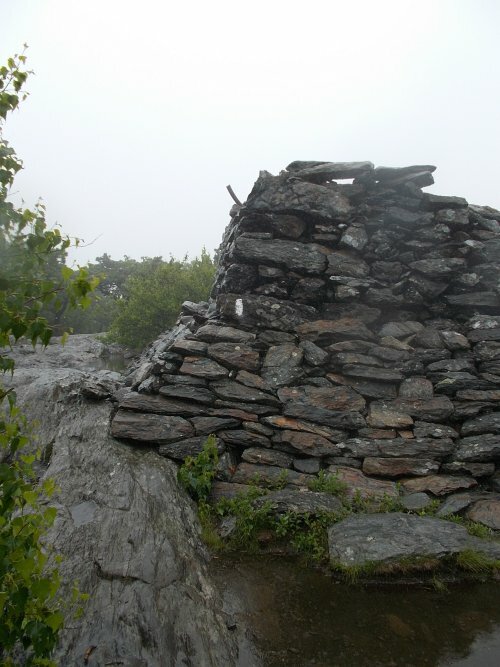 The top of Bear Mountain, and the highest summit in the state! 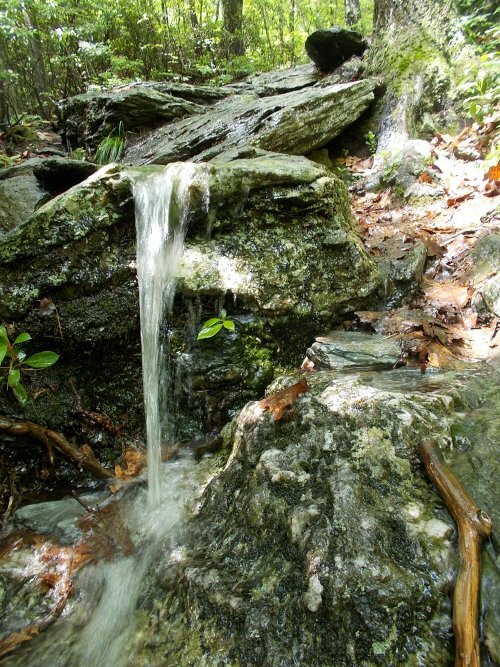 A pretty little waterfall, right? NO! 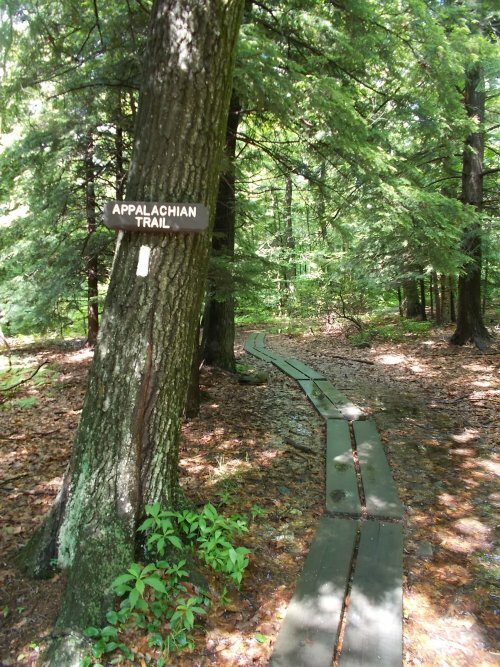 This is the TRAIL! My improv border monument. Hello, Massachusetts! Goodbye Connecticut! If I had thought about it at the time, I'd have made sure the knot in my left shoe was visible! I'd cut the knots of that shoe at the end of the day. Lots of waterfalls today! 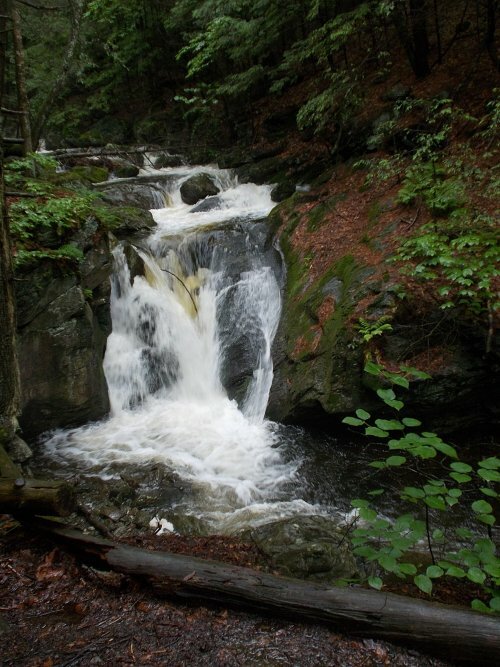 Fortunately, THIS is a real waterfall and not the trail! The "official" MA/CT border sign is 0.6 miles into Massachusetts. The trail crossed this creek. 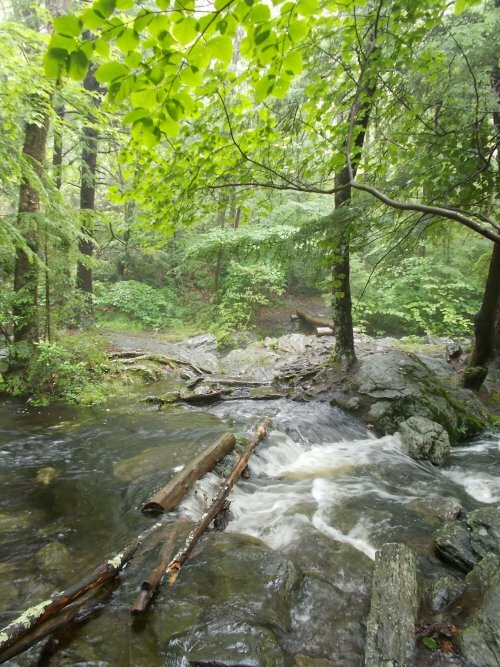 I forded through it in fast-moving knee-deep water, but other hikers I talked to later said they just walked across on those logs without even getting their feet wet. The rain, obviously, made this creek a lot higher and faster! Nearing Mt Everett, the sky is starting to clear! 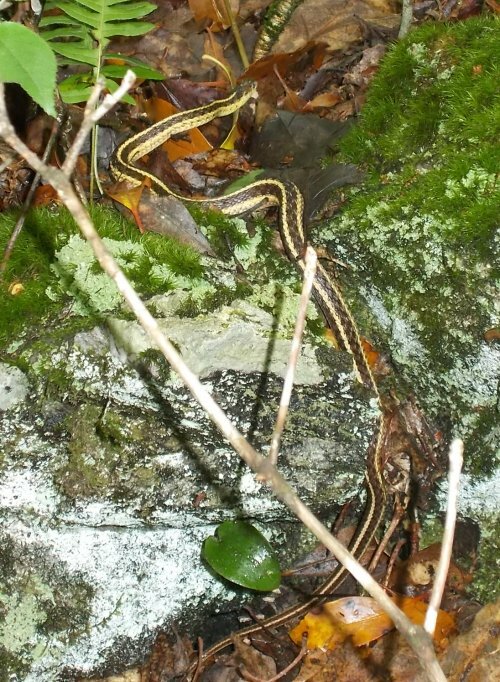 You might think all that rain would discourage snakes from coming out, but you'd be wrong! I set up my tarp before any rain can get my gear! Clueless got us involved in this crazy hobby many moons ago!